Ghostwolf goings-on. Run with the pack. Visit us on our website. Woof! Hi Folks! We apologize for the duplicate message, but we missed a typo in our last mail. 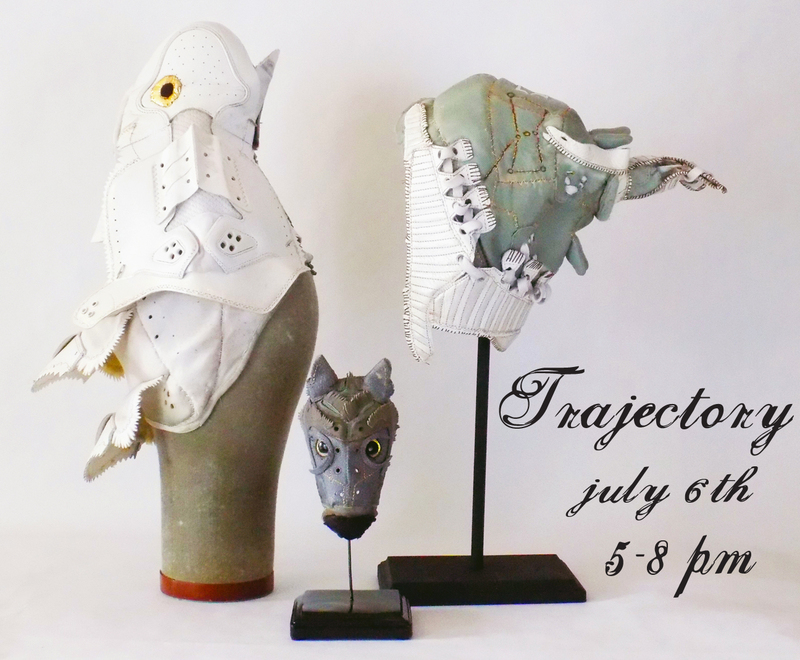 You haven’t missed it… “Trajectory” opens tomorrow night, Friday, June 6th (5-8pm)! 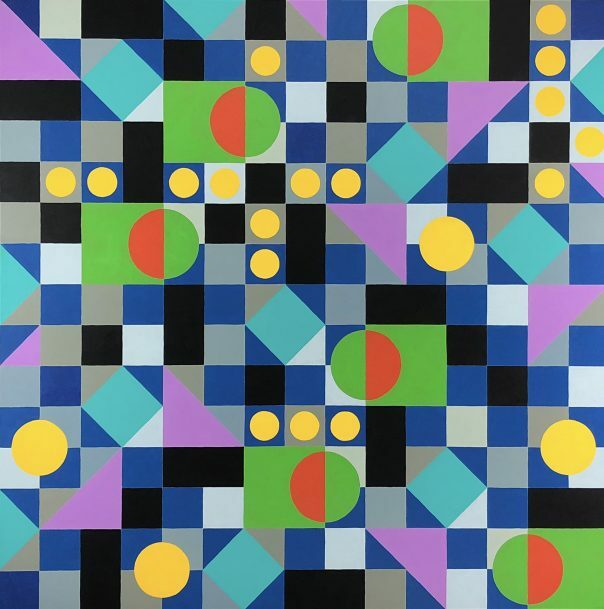 This first Friday Sean Paul Gallegos presents an exhibition entitled “Trajectory”. 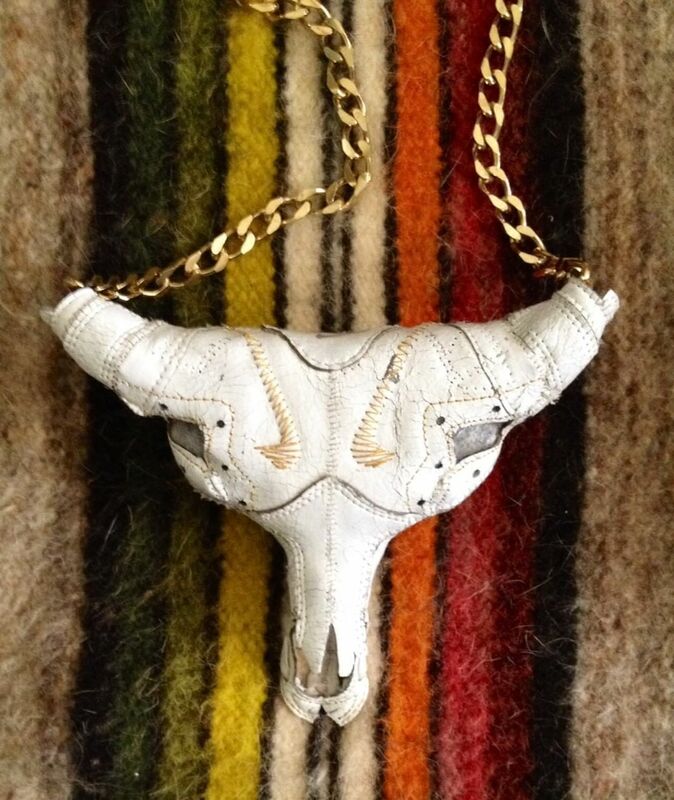 Gallegos’ innovative hand-stitched 3D pieces transform sneakers and everyday items from the trash into objects of cultural significance. Iconic & inspired, “Trajectory” features five new works exploring his path as an artist in the past, present, and future. 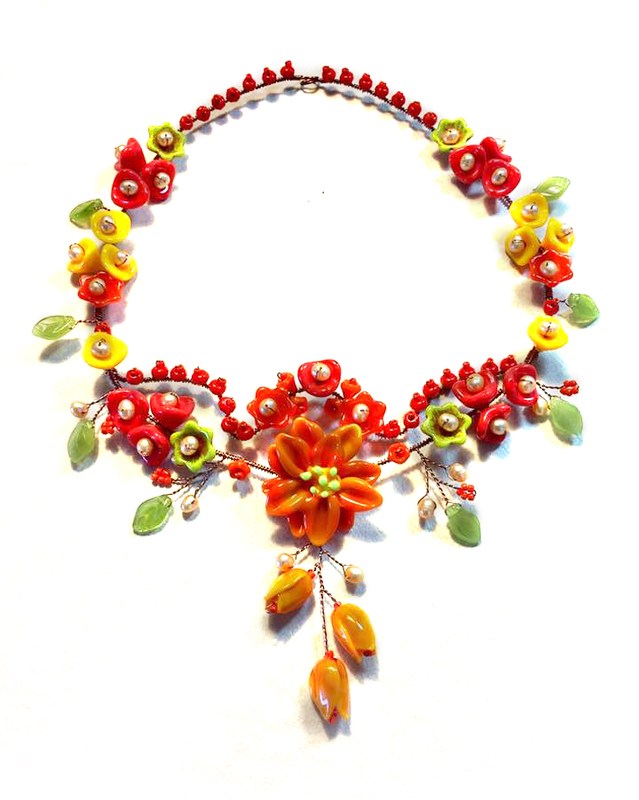 Gallegos is one of two Ghostwolf artists with work acquired for the Albuquerque Museum’s “American Jewelry from New Mexico” show! You can read more about Sean Paul on our website, and be sure to subscribe to his Instagram feed! In collaboration with Sierra Club, Mural Fest 2018, and Tortuga Gallery, Ghostwolf artists Denise Weaver Ross and Roe LiBretto along with mosaic artist and sculptor Joel Davis will paint a nearly 25′ x 90′ mural, celebrating the flora and fauna of Albuquerque’s Rio Grande Bosque. Installation of the mural, which will wrap around Tortuga Gallery at 901 Edith SE, is scheduled to begin this September and be completed the following month. 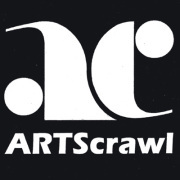 This ambitious project kicks off on July 6 with a fundraiser previewing the mural design in which participating artists Denise Weaver Ross, Roe LiBretto, and Joel Davis will exhibit their individual works. Funding for this project includes sponsorship opportunities, a raffle of the mural artists’ work, and a Go Fund Me campaign through which 15% of the money raised will go to Sierra Club’s Bosque Action Team. We encourage you to support our artists’ effort to preserve the Bosque by donating to the project here: https://www.gofundme.com/tortuga-gallery-mural-fest-project. You can follow the project’s progress on Facebook https://www.facebook.com/tortugabosquemural// or stop by Ghostwolf and ask the artists in person! 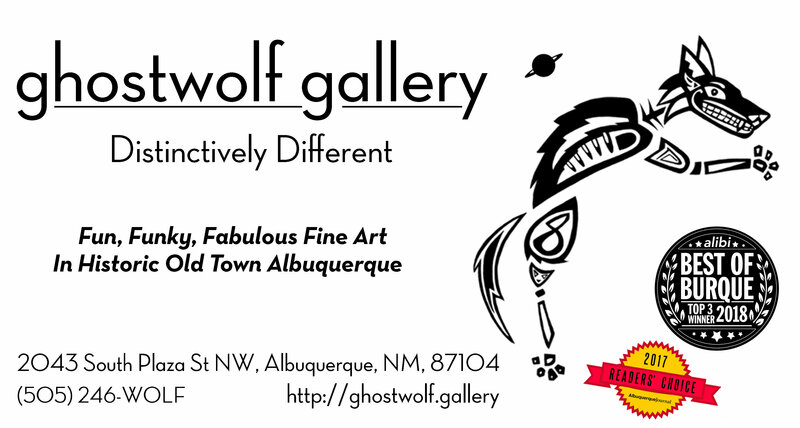 Two Ghostwolf artists have pieces in the ongoing “American Jewelry from New Mexico” exibit. The museum has acquired these pieces for its permanent collection. Per the museum website: “Albuquerque Museum presents a major exhibition with accompanying book published by the Museum of New Mexico Press, surveying, through more than 300 spectacular objects, all aspects of jewelry adornment from prehistory to the present. Rather than focus on a single culture group, individual artist, time period, or medium as have most jewelry exhibitions and publications, American Jewelry from New Mexico tells the stories of diverse heritages simultaneously, as artists live, in concert, trade, and adaptation with their neighbors. Learn more about Pirate Contemporary here! Copyright © *|CURRENT_YEAR|* *|Ghostwolf Gallery|*, All rights reserved. If you’re unsure as to why you are receiving our mailing, you probably opted in at our gallery or purchased artist work. We’d hate to see you go, but unsubscribing is or changing how you receive mail from us is easy.